Projects by this year's W Hotels Designers of the Future Award winners - Markus Kayser, Philippe Malouin and Tom Foulsham - have been unveiled at Design Miami/Basel. 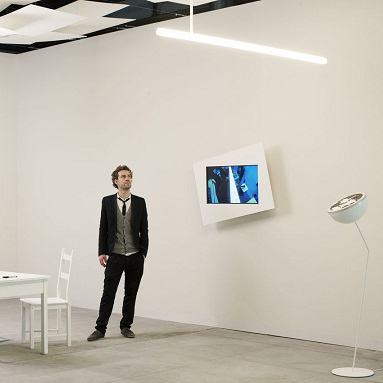 Kayser presents an office tube-light (above) that mimics modulations in daylight by changing its intensity and colour while moving 360 degrees over the course of a day. Malouin's wall-mounted lamps (above and below) imitate light from windows by bouncing LED light off the wall behind and through shutter-like slats. Foulsham (below) shows an elaborate structure balanced on a single point so that visitors can move it using hairdryers, fans or just their own breath. Design Miami/Basel opened today and continues until 17 June. See all our stories about Philippe Malouin here and all our stories about Markus Kayser here. This is the third year that W Hotels has worked with Design Miami/ to present this award, which gives emerging designers a global platform to showcase their work. The projects debut at Basel and then travel to W Hotels around the world. This year’s theme, “From Spark to Finish,” encouraged designers to create work that sheds light on their own creative process, demonstrating how the spark of inspiration evolves into material designs. The projects involve an interactive element, encouraging visitors to experience the creative impulse for themselves. Kayser’s LIGHTzeit explores how natural light constantly changes through motion, intensity and color rendering, whereas most artificial light sources are entirely static. LIGHTzeit is a minimal light installation resembling the ever-static tubular lights widely used in offices and public spaces. But this light picks up the notion of light in transition by constantly, but unnoticeably, travelling in a 24-hour cycle, 360-degrees around its axle like clockwork. While the position of the light changes, the light’s qualities adjust in color temperature and intensity throughout the day, reconnecting it to the natural rhythm. The user can set the place and time of day by an interactive switch in the form of an abstract world globe. Malouin has unveiled Daylight, a series of lamps or artificial windows inspired by plantation shutters. Rather than mounted, the shutters are secured to a bare wall and contain an artificial light source. Each individual slat is lined with LEDs that replicate the color temperature of daylight. The light emitted is reflected back from the wall on which the window is mounted to produce the impression that a real window lies behind. Light intensity can be adjusted by manipulating the angle of the shutters. The shapes of the lamps are based on the Tangram: a Chinese dissection puzzle. Each geometric shape of the Tangram shares a set of common proportions, allowing the lamps to be arranged in multiple, complementary configurations. Also on display from Malouin are a selection of drawings; failed and working prototypes, artefacts and pictures; which map out the design process timeline from the "spark" of the initial concept to "finished" design.